Comment: President Bachelet of Chile has begun a process of reform including tax, electoral and education matters in Chile. The ultimate goal of these reforms is to increase inclusiveness in the society and strengthen the middle class thereby providing long-term sustainability to the system – a shared goal in Chile. The degree and rapidity of the changes including an assessment of the full economic impact for the country and its people is the subject of internal dialog in the country. Chile has been known for its ability to construct a broad consensus – a hallmark of its political and economic success. The article written by Ms. Mary O’Grady is premature in its conclusions. 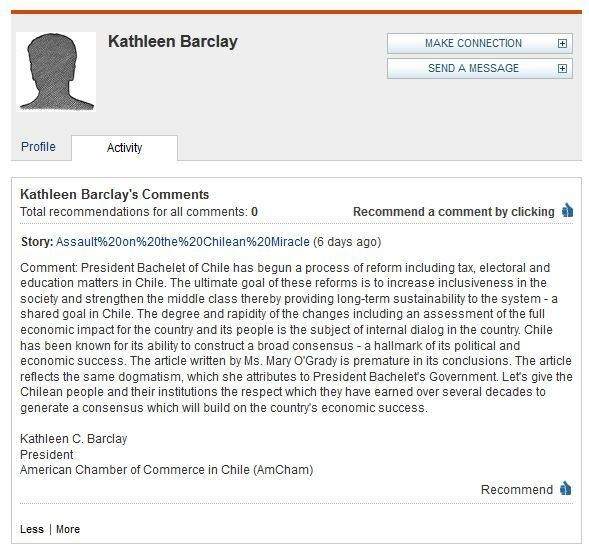 The article reflects the same dogmatism, which she attributes to President Bachelet’s Government. Let’s give the Chilean people and their institutions the respect which they have earned over several decades to generate a consensus which will build on the country’s economic success.